The report from my garden this week is rather brief. Plants grew in between all the rain we had last week. I have lost count of how many days it has rained. Maybe it would be easier to count sunny days? The weatherman said after last night’s rain, this is now the third wettest June in Indianapolis since they started to keep records. Between the rain, work, and other responsibilities of the past week, I had very little time to spend in the garden. What time I did have was mostly spent just watching it grow, deadheading daylilies and pulling obvious weeds. Obvious as in, “my, that weed is tall”. Yesterday I drove to southern Indiana for the annual family reunion and got to see my uncle’s vegetable garden. His garden is one zone south of me but always seems a month ahead of mine. I’ve never seen squash leaves so big or tomatoes quite that tall. 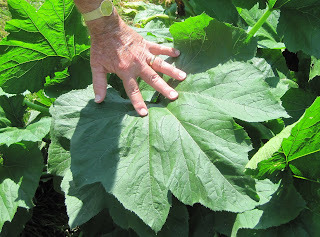 Plus he has already picked somegreen beans and okra. I quizzed him for his secrets and he said he did till in a load of well rotted horse manure earlier in the spring. Plus, for some of his tomatoes, he dug big holes and mixed in more horse manure. Part of the garden was still wet, so he didn’t do it for all of them. As you can see in this picture, it seems to have made a difference. The tomato plants on the left didn’t get the full manure treatment. 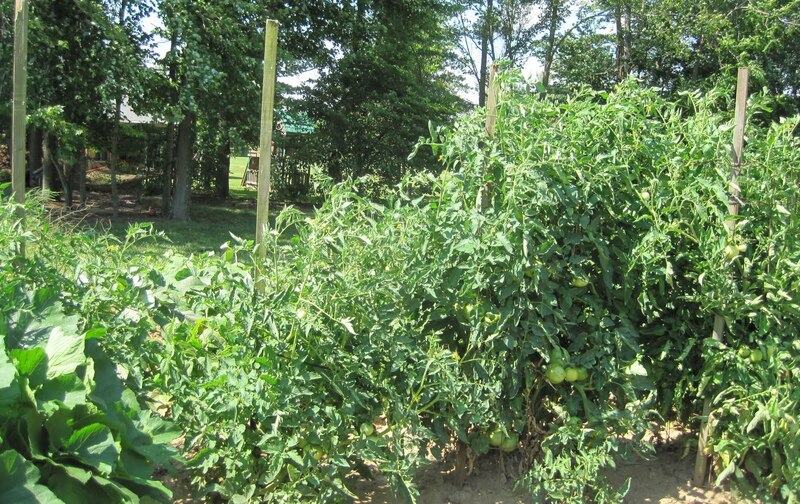 They are still big tomato plants, but not quite as big as the ones on the right which did get extra horse manure. He said he normally picks his first tomato around July 4th but this year he has already picked a few ‘Early Girl’ tomatoes. His other secret was when it got hot earlier than usual in the spring, he went ahead and planted squash. Everyone said he’d get frosted out, but he figured that squash seeds are cheap enough that he’d take a chance. He said he plants by the weather, and not necessarily by the calendar. I’m more of a calendar planter, in that I wait for a certain date to pass, and then verify the weather. Hmmm… I might re-think that for next spring because seed is fairly cheap. Anyway, I have never seen squash plants with leaves as big as his. And down under those leaves are several summer squash just waiting to be picked. Today, weather permitting, a crew will be here to start installation of the new patio. They should be done in five to six days. Then on Thursday, I’m meeting with the garden designer to talk about plantings in the back yard and than it will be the 4th of July weekend. But enough talk about the end of summer. I haven’t even picked my first tomato! We have many summer days to enjoy, including most of this week which should be dry and pleasant in central Indiana. I hope to spend many quiet evenings in the garden between now and next Monday. 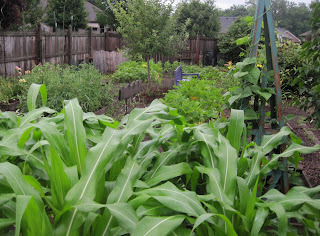 Hope to hear soon how everyone else's gardens are doing as June ends and July begins. My gardens are doing great too! With the excepting of our tomato plants - not sure what their deal is...but they are looking a tad under the weather. Carol, everything is giant this year. My tomato plants are as big as they usually are the end of July. I wonder what they will look like in August. The garden's looking good, Carol! 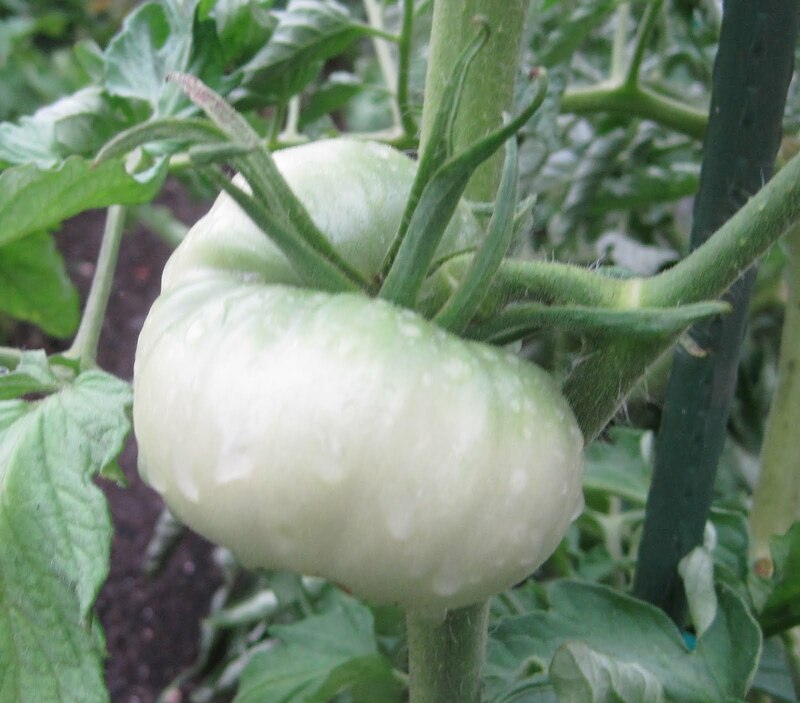 I hope you'll soon start harvesting lots of tangy tomatoes and sublime squash! What a fine letter, Carol -a distillation of mid-summer in Indiana, right down to the cicadas. We've had some tomatoes in the last few weeks, but the intense, too-early heat may mean that we've picked our last tomatoes just as you hover over your first! How lovely to have an uncle with a real vegetable garden! Did you come home from the reunion with a "goody bag" full of brown gold in your vehicle?